These Sugar Cookie Bars are so yummy and much easier to make than traditional sugar cookies! The dough is baked on one large cookie sheet, then topped with a homemade vanilla frosting. Just slice and enjoy! I can’t believe that Valentine’s Day is just a few days away and I haven’t shared a single recipe yet! I love Valentine’s Day and all of the fun treats that go along with it. One of my favorites are these Buttermilk Chocolate Cupcakes I made for Valentine’s Day last year. They have a whipped ganache frosting! I love Valentine’s Day for a couple of reasons. One: it’s actually my parents’ anniversary! Because of this, they always made a big deal out of Valentine’s Day when we were growing up. We would have a special dinner together as a family, and we’d each get packages with plenty of treats and candy. It was always a fun day that we looked forward to. So yes, I really do love Valentine’s Day. I know a lot of people think it’s another commercialized holiday, but to me, it’s all about love. It doesn’t just have to be about romantic love, either. It’s a great excuse to share some love with your friends, your family, your kids, coworkers, even your dog! Yep, I think our wrinkly bulldog might even get a couple extra milkbones on Sunday. 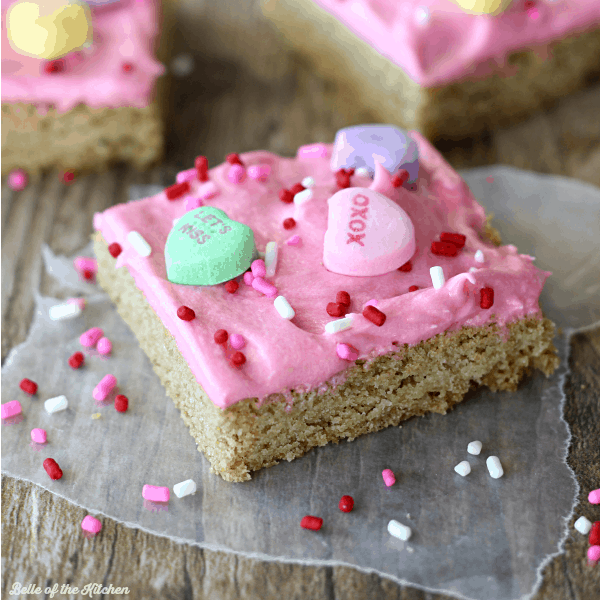 So if you’re looking for a special treat to celebrate Valentine’s Day, these sugar cookie bars would be perfect! 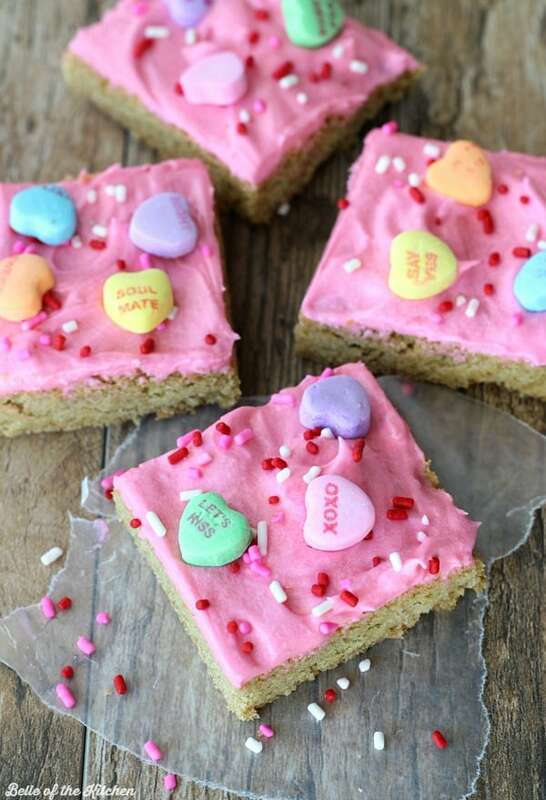 They are a lot easier to make than regular sugar cookies since the dough is baked altogether on a a rimmed cookie sheet, topped with frosting, then cut into bars. I made these with half white sugar and half brown sugar because I am a brown sugar addict. I love the flavor and texture it gives to these bars compared to using all white sugar. The vanilla frosting I made to go with these is my go-to frosting recipe. I like it on just about anything! But you could definitely use store-bought frosting if you’re in a pinch. Enjoy y’all! Preheat oven to 350 degrees. Line a 15x10 inch rimmed baking pan with parchment paper or spray with nonstick cooking spray and set aside. In a large bowl, beat together the butter and sugars until light and fluffy. I let mine beat for about 3-5 minutes. Beat in the eggs and vanilla until smooth. In a small bowl, sift together the flour, baking soda, and salt. Gradually add dry ingredients to the batter a little at a time, beating over low speed. Batter will be sticky. Evenly spread batter into prepared baking pan. I greased both of my hands with cooking spray and used them help spread out the batter. Bake in preheated oven for 20 minutes, or until edges are golden brown. Remove from oven and allow to cool completely. To prepare frosting: beat together butter and powdered sugar until smooth. Add in the vanilla extract and milk and continue beating. Add in food coloring if desired. Spread frosting over the top of cooled bars and slice into squares. Enjoy! What a great idea to make these in a bar form! Pinning for Valentines Day! 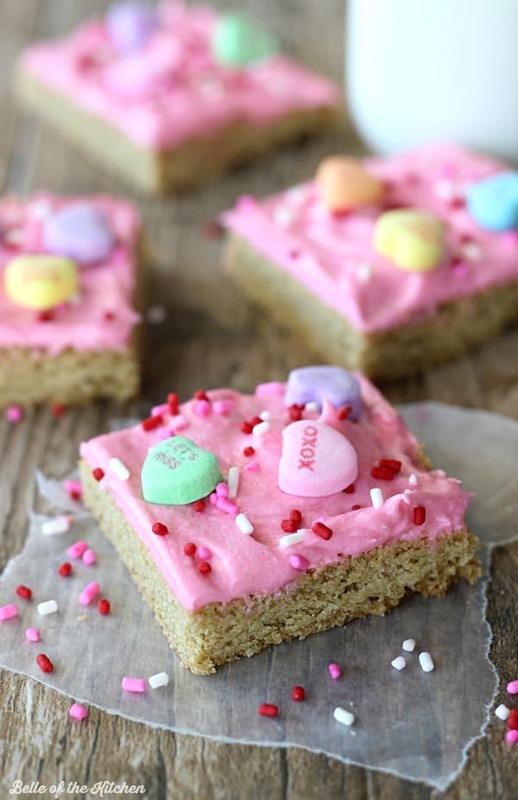 How cute and tasty this frosted sugar cookie bars look! Love the combination and how easy are to make and put together. Now I need one with my coffee! 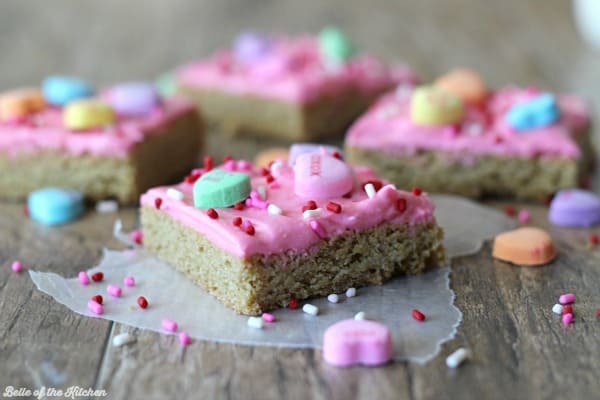 These cookie bars look so cute! I love the frosting and conversation hearts candy on top! These frosted sugar cookie bars are the perfect treat for many occasions! I love the frosting on them. These look so cute, perfect as a special treat for parties etc. These are so sweet and adorable! Can’t wait to try! These are so pretty!! Love them! And sounds like you have lots of things to celebrate for Valentine’s Day 🙂 Enjoy!! 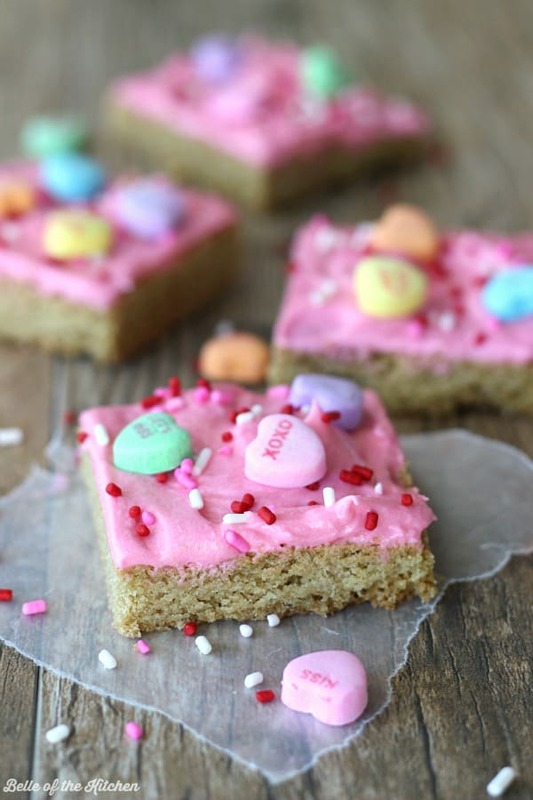 So many reasons to love Valentine’s day….including these delicious looking bars!!! These are seriously so cute!! That frosting looks divine! These are so cute! What a perfect Valentine’s Day sweet! I love that your husband proposed around Valentines Day! Something to remember each year. I love these cookie bars! Looking for something to bring to my son’s class party Friday, and these might be it! These are so cute! Perfect for Valentine’s day! If only I could keep enough candy hearts in the house long enough to do something with them. My boys eat them like they are going out of style!